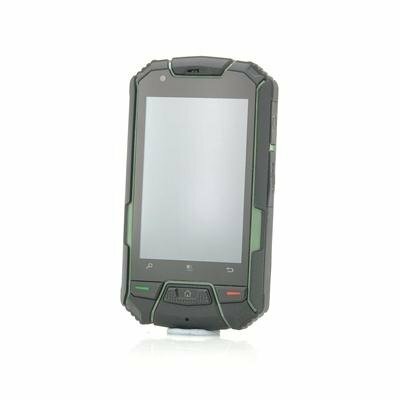 Successfully Added Ruggedized 3.5 Inch Android Dual Core Phone "Buffalo II" - 960x640, Waterproof, Shockproof, Dustproof (Green) to your Shopping Cart. 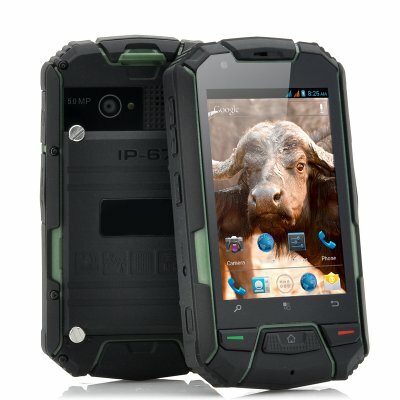 Ruggedized 3.5 Inch Android Dual Core Phone features a quality high definition resolution of 960x640 as well as being Waterproof, Shockproof and Dustproof, making sure this phone is tough enough. Ole! The elements better be careful if they try and take on this waterproof rugged Android phone that is known as the “Buffalo II”. Throw it, drop it, and body-slam this phone and it can take a lot of what it encounters making it an ideal choice for any hard hitters working in tough environments such as bouncers and builders. Having a waterproof rating of IP67, the “Buffalo II” is not afraid to get its hooves wet as it is proven to fully protected against dust ingress and also can survive a submerge in water of up to depths of 1 meter. Proving that is can compete with the toughest; the “Buffalo II” has an outstanding 1GHz Dual Core MTK6577 processor that means it can run applications effortlessly without encountering any problems. This phone has the strength and toughness but it doesn’t cause the user a problem in size as it has a clear 3.5 inch screen that offers a QHD 960x640 resolution therefore all your media will be displayed clearly. A useful feature about the “Buffalo II” is that it can support two SIM cards, therefore you can mix business and pleasure on one phone as all your contacts will be centralized. When it comes to operating systems, the “Buffalo II” has the most popular and probably the best as it uses and Android operating system. Android offers the user a level of freedom not provided by other operating system, plus there is the huge advantage of allowing access to the Google Play store so that users can download and install applications that suit their needs, hobbies and lifestyle. Slam and crush the competition like they are an arrogant matador with this Android rugged phone known as the “Buffalo II”. This product is in stock and can be dispatched within one working day of ordering with a 12 month warranty. Brought to you by the leaders in wholesale electronics and Android phones, Chinavasion. The product has an extra tough screen that is scratch and impact resistant, however that does not mean it can not be scratched or even cracked under high impact damage. Chinavasion recommends not subjecting this phone to cruel and unusal punishment as no phone's screen can resist objects falling on it from high altitude, or heavy impact damage. In cases the phone falls, the phone will automatically power off to protect its systems and the user will need to power it on again. If issues with turning it on again, use manual hard reset button.